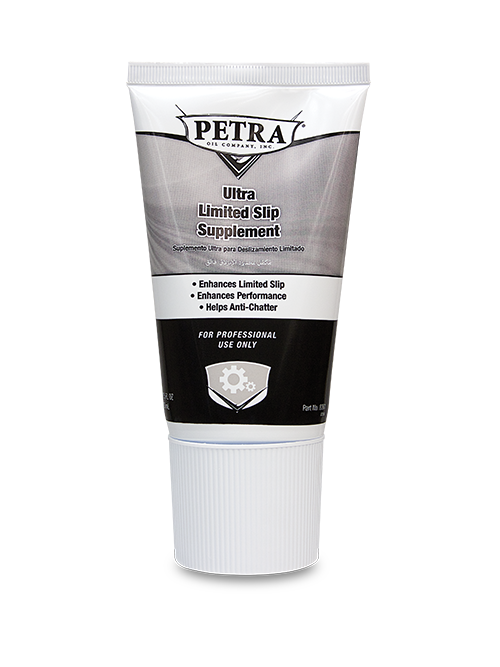 Petra Ultra Limited Slip Supplement is a specially formulated friction modifier that will enhance limited slip and help anti-chatter. 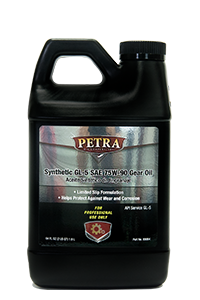 It is recommended for friction modification of the gear lubricant for front and real axles of 4x4 and AWD vehicles as well as rear axles of trucks and passenger cars equipped with clutch-type limited-slip differentials. 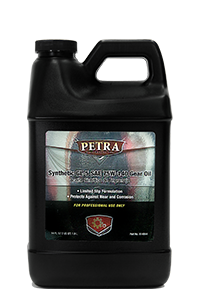 Petra Synthetic 75W-90 gear oil is a full synthetic premium quality gear oil for transmissions and final drives. It meets the toughest industry specications for automotive extreme pressure (EP) gear lubricants including limited slip differentials. 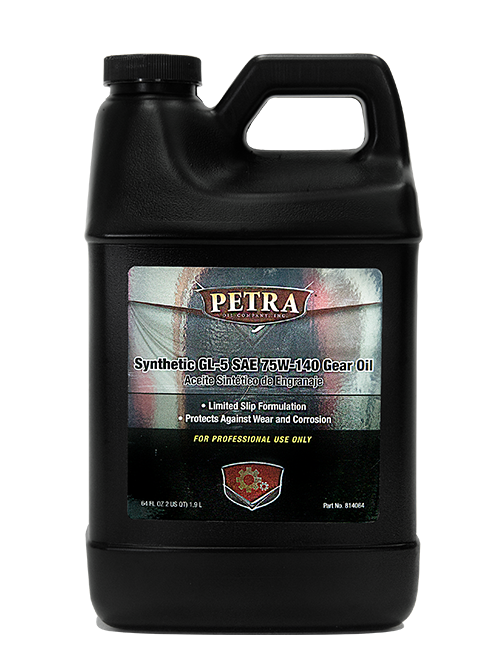 Formulated for extreme pressure offset spiral bevel and hypoid gear sets (ring and pinion gears) in heavy duty trucks, farm, logging and construction machinery. 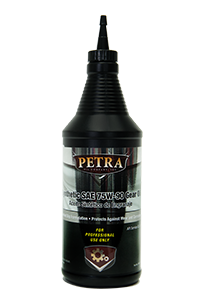 Petra Synthetic 75W-90 gear oil combines a premium performance additive package with a high quality synthetic base stock. 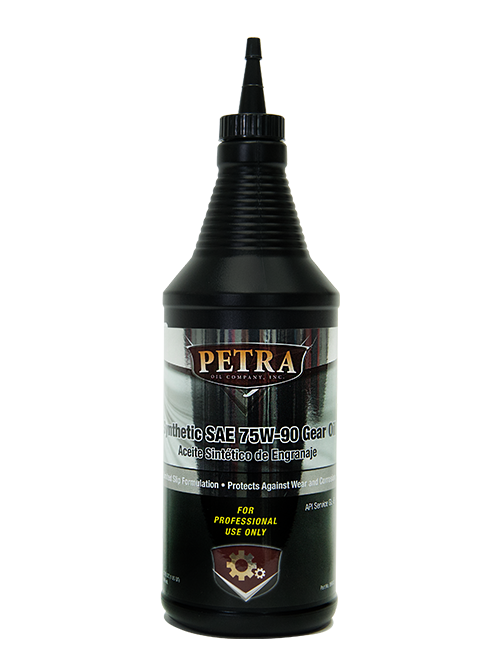 It is specifically formulated for use in passenger cars, light duty trucks, heavy duty trucks, farm tractors, earthmoving construction, differentials, steering gears requiring a hypoid and other heavy duty equipment. They meet the requirements of: API GL-5, MAN 342N, SAE J306b, ZF TE-ML 05A, US Military, MIL-L-2105 C and D, 75W, TE-ML 12E, AGMA 9005 E 02, U.S. STEEL 224, DIN 51527 Part 3 and David Brown S1.53.101. 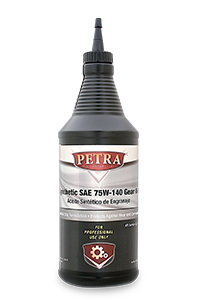 Petra Synthetic 75W-140 gear oil is a full synthetic premium quality gear oil for transmissions and final drives. It meets the toughest industry specifications for automotive extreme pressure (EP) gear lubricants including limited slip differentials. 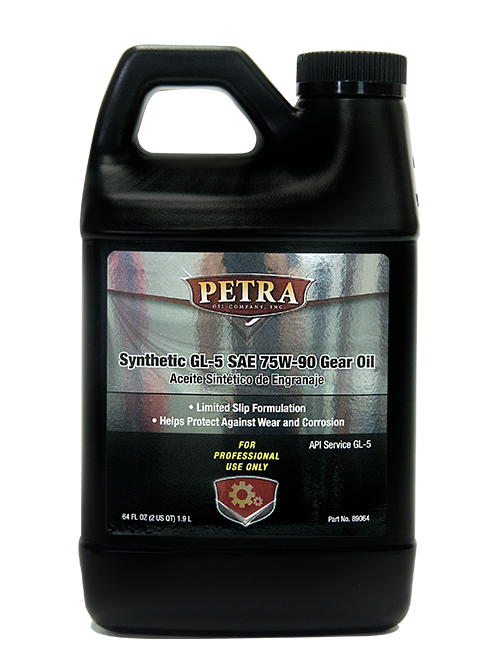 Formulated for extreme pressure offset spiral bevel and hypoid gear sets (ring and pinion gears) in heavy duty trucks, farm, logging and construction machinery. 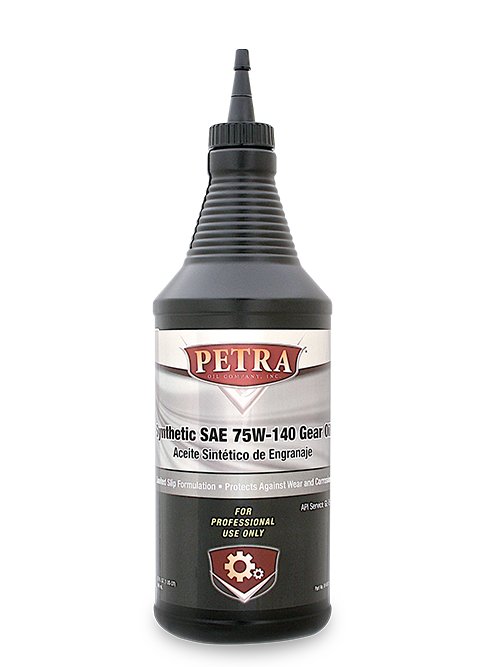 Petra Synthetic 75W-140 gear oil combines a premium performance additive package with a high quality synthetic base stock. 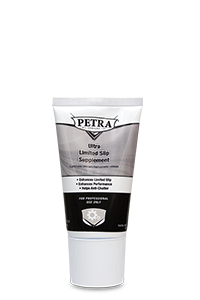 It is specifically formulated for use in passenger cars, light duty trucks, heavy duty trucks, farm tractors, earthmoving construction, differentials, steering gears requiring a hypoid and other heavy duty equipment. They meet the requirements of: API GL-5, MAN 342N, SAE J306b, ZF TE-ML 05A, US Military, MIL-L-2105 C and D, 75W, TE-ML 12E, AGMA 9005 E 02, U.S. STEEL 224,DIN 51527 Part 3 and David Brown S1.53.101.